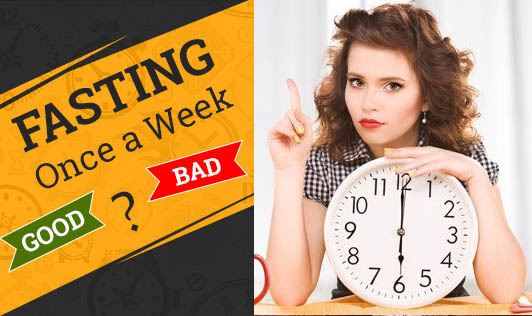 Fasting Once a Week - Good or Bad? The article says that, with an increase in the rate of diabetes and other lifestyle related disorders, not eating once a week will help you maintain a sensible weight. But will it really work for you? I say ‘NO'. Why and how? Below is the explanation. • Fasting is no doubt simple and cheap, but how many of you will be able to control your craving the next day? It not only increases your craving for food, but also makes you eat more than usual. This is especially true in cases where you fast on water only. • If you are planning to fast once a week to burn that stored fat in your body, then again it is not sensible because your body requires about 24hours to start utilizing fats from the stores on a water-only fast. So if you stay on only water for a couple of days to burn the fat? You will end up with IV fluids in that case! • Fasting once a week is also not a way to detoxify your body because the toxins are stored in your fat reserves.